Auditorium for a night full of magical giving. Every year, Uptown Sertoma presents Auction for a Cause where live and silent auctions will take place as well as free food and musical entertainment to enjoy all night. The event is a ticketed occasion where you can pay $20 in advance online or a cover charge of $25 at the door. There will be hundreds of items for auctions brought to you by local non-profits including yours truly. All items auctioned are valued for at least $50-but usually are much more. 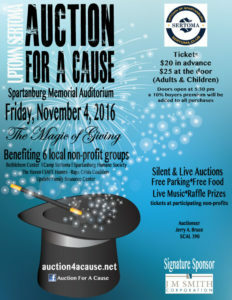 Some items being auctioned include: a 55” flat screen Smart TV, Southwest airline tickets, a four night stay in Myrtle Beach and much more. Tickets are available at the UFRC.